We custom make every basket so you can be assured a unique gift for all occasions. Great gifts for that special someone are only a phone call away. Gift baskets are the perfect way to say Thank you, Happy Birthday, Congratulations, Welcome, “You’re the Greatest”, Happy Holidays and many more. 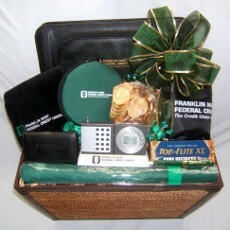 Incorporate your business logo into the perfect, cost effective gift! Copyright © 2007-2015 Baskets by Donna, LLC. All Rights Reserved.